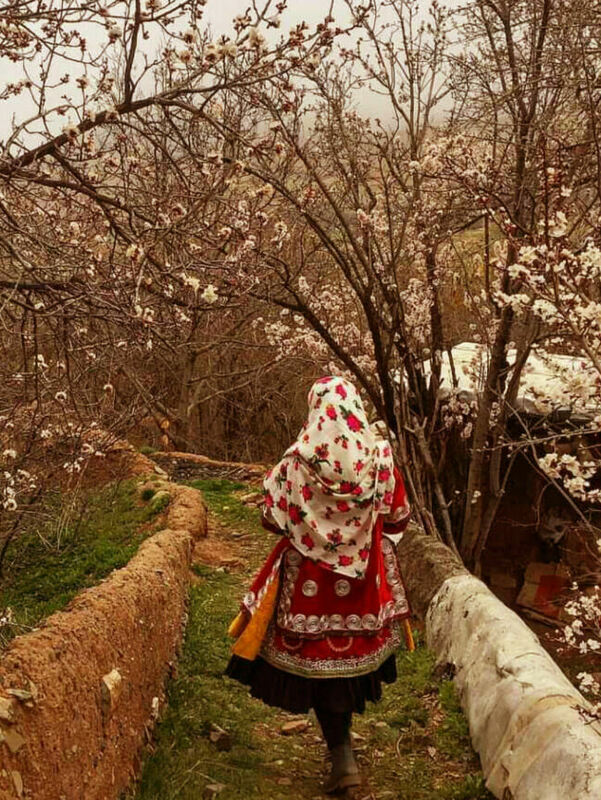 One of Iran’s most spectacular villages.Abyaneh is one of the few villages where its inhabitants have retained their traditional clothing to this day. It is also of interest to tourists. 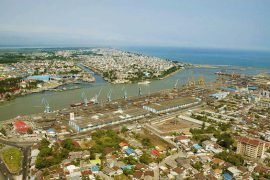 It has good facilities provided for local travelers and tourists alike. The long time ago the locals moved out of the village not knowing that someday it will indeed become a tourist attraction. Nowadays, for various reasons villages are considered to be points of interest in terms of tourism. The reason might be the cultural heritage found in these types of places or the monuments found in them or even religious attractions located in the villages. 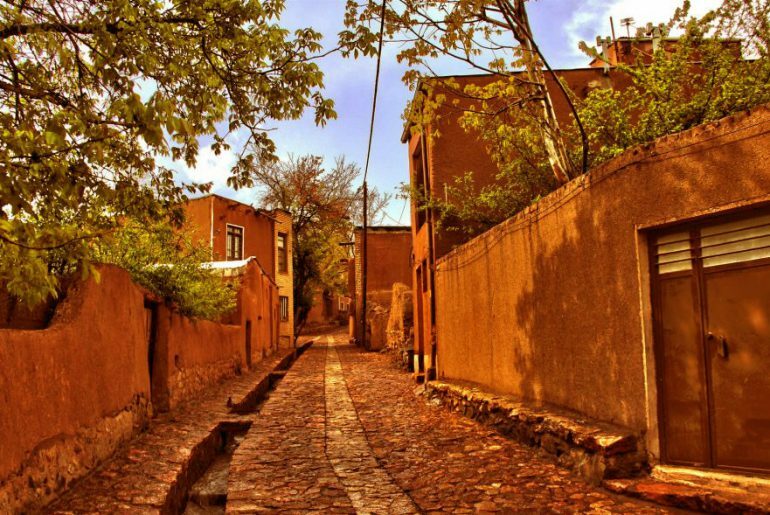 All over Iran, there are spectacular villages that can be considered a tourist attraction. Some of them are quite famous and people visit them year round, while some of them are yet unknown. 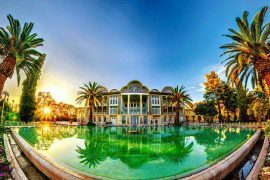 Abyaneh is one of the famous ones; a village located within Isfahan Province, in Natanz County. 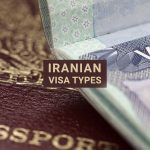 On the Persian Gulf freeway, there is a sign in the middle of Kashan-Natanz road, which leads you to the village, when you see it, that’s your cue to exit the freeway. As you follow the road, a narrow and twisted path appears before you, be careful but at the same time try to enjoy the scenery. Eventually, after that, you will reach the village. 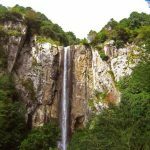 It is located 35 km northeast of Natanz County, on the slopes of Karkas Mountains. 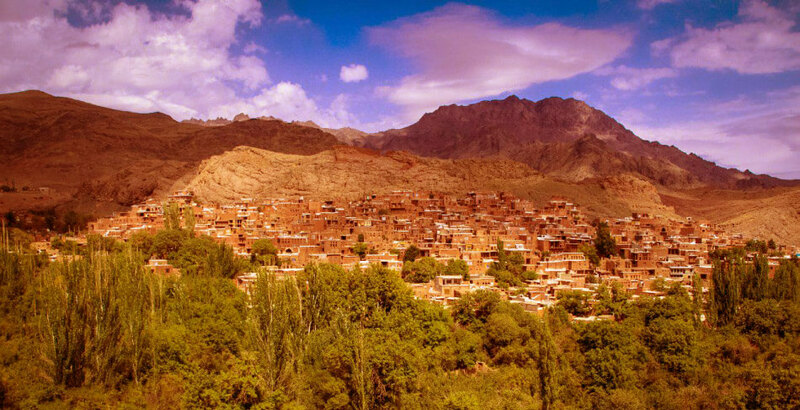 The height of the village from the sea level is 2222 meters, and therefore it is referred to as one of the highest residential areas in Iran. The length of the village’s historical section is 900 meters and its width is about 3 meters. Architecture is interesting and its monuments are very diverse. You also see various religious elements in this village: the remnants of a fire temple, a congregational mosque, and a shrine. The local’s traditional clothing is also one of the things that attract the attention of visitors. There is no real evidence indicating the exact time of the formation of the village. 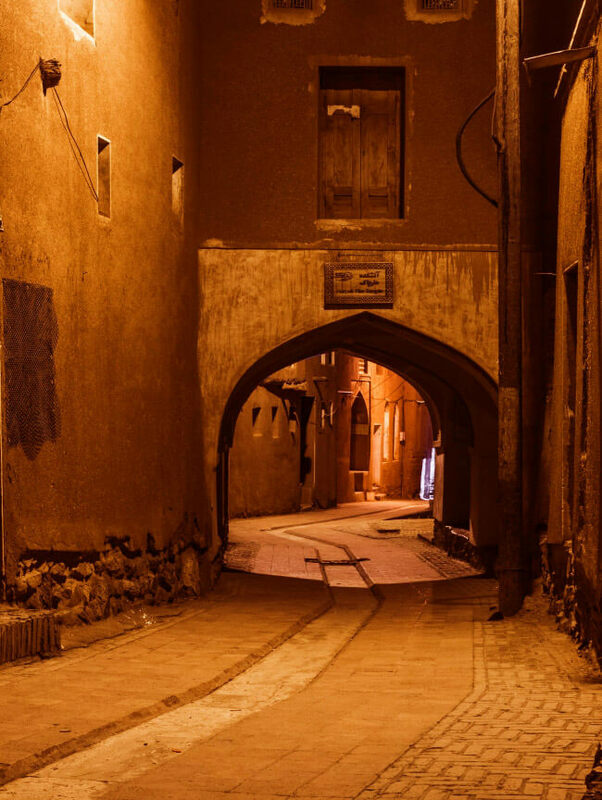 According to some, the village dates back to 1500 years ago. 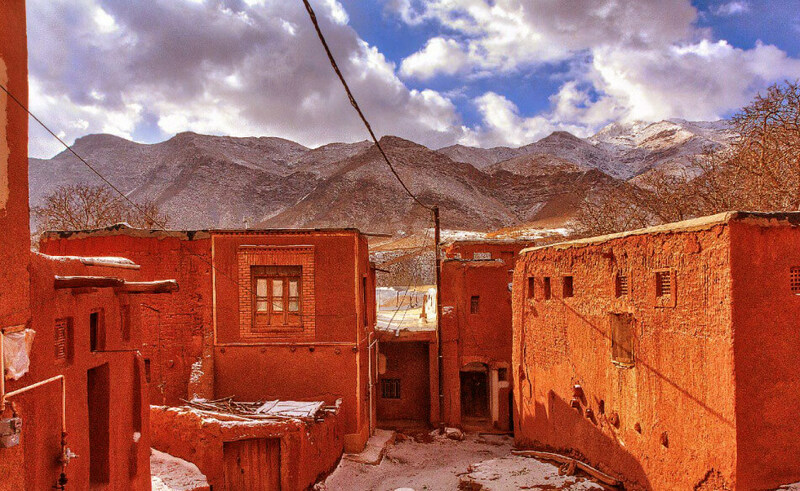 They consider Abyaneh as one of the oldest settlements found in the Dasht-e Kavir. 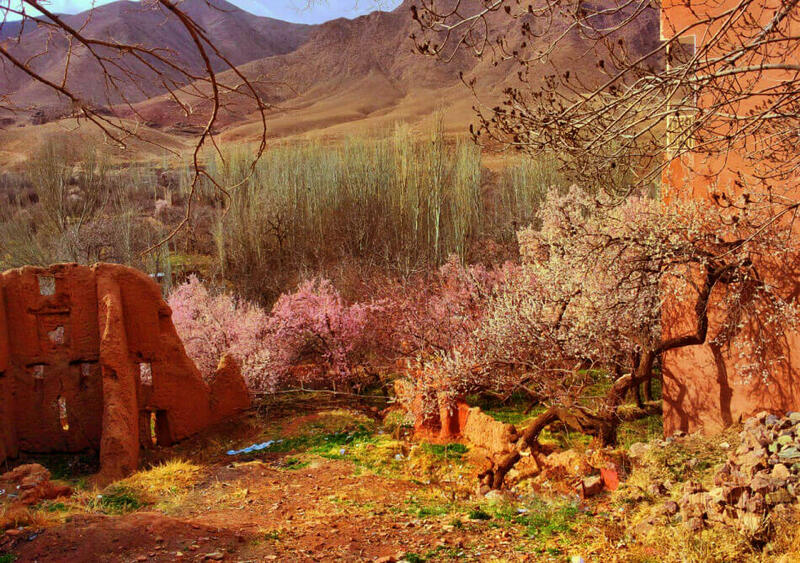 There are works from Sassanid, Seljuq, Safavid, and Qajar periods found in the village. They can certify as to how old the village really is. 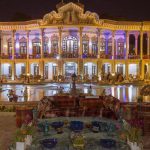 It is said that back then Safavid kings preferred Abyaneh as an overnight stay for when they traveled as part of the Natanz Yaylak. The existence of historical and cultural monuments and their spiritual value has added to the importance of this village. Abyaneh was listed as a national monument in the year 1975. In order to know the village and recognize the location of the attractions, it is essential to know the names of the neighborhoods in the village. 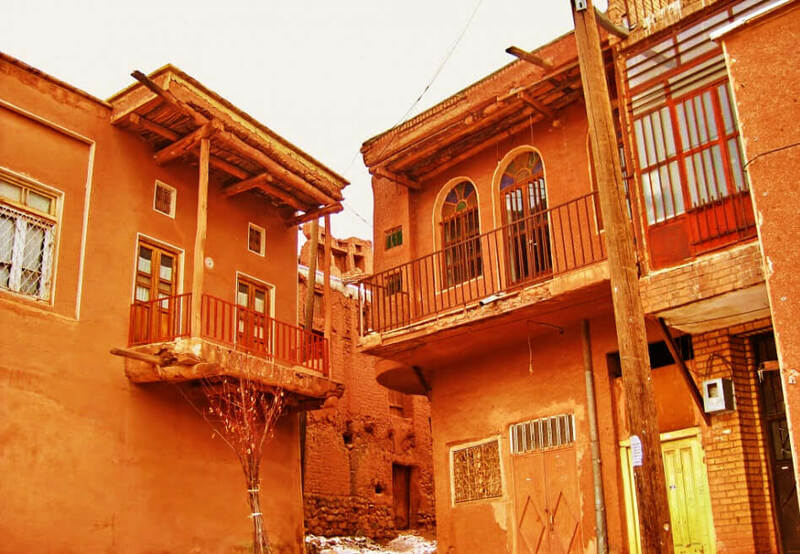 Abyaneh has 3 main neighborhoods: “Herdeh” which includes the southern parts of the village, “Yosemun” and “Pal” which include the northern parts of the village. 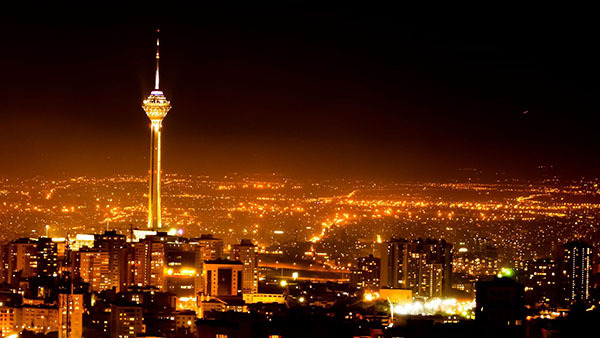 Yosemun and Pal are considered to be the high-class neighborhoods. The city has changed. 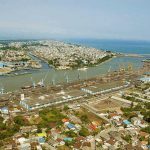 New developments and constructions have created three particular streets with which you need to be familiar. The main one: starts from the gate in the southern parts of the village and it goes to the one in the northern parts of the village, The Backway: starts from the school in the east and goes to gate in the southern part of the village. 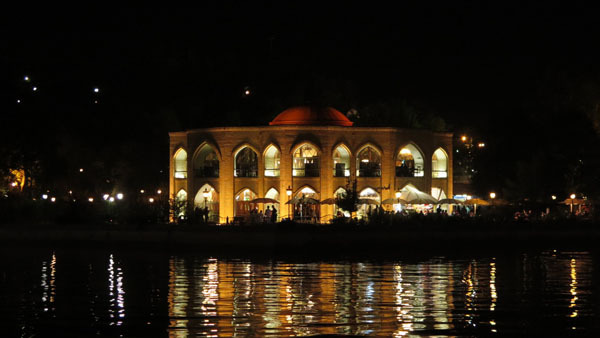 The Yosemun starts from the Khanqah and goes to the Yosemun square. The first thing that affects you upon entering Abyaneh is the houses; made of red colored cob with white colored vaults and wooden windows. 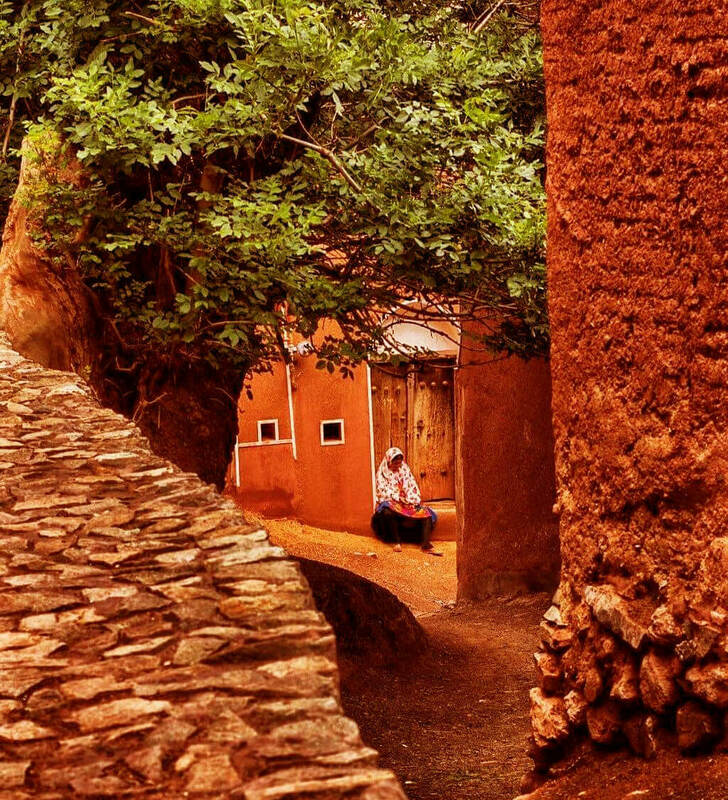 The exterior of the houses is covered with red soil, from the mine located next to the village. 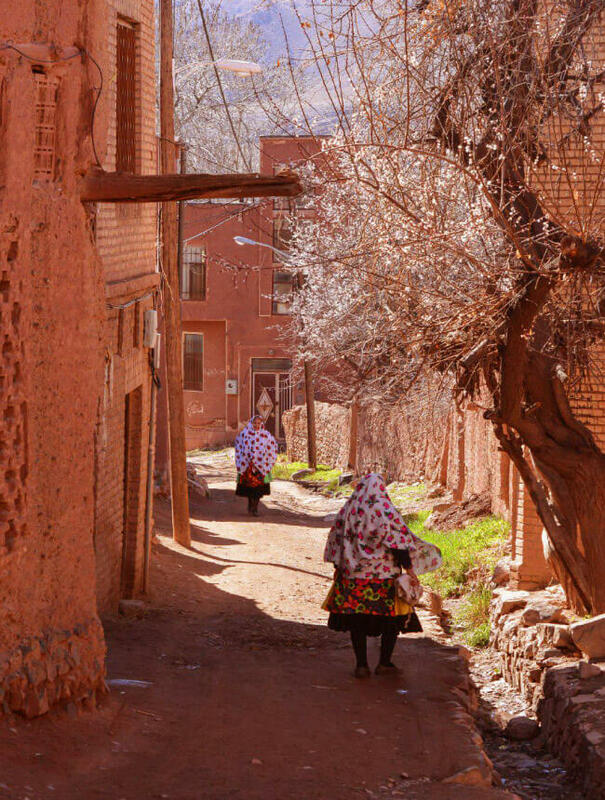 Due to the color of the soil and the beautiful effect it has had on the houses, Abyaneh is known as the Red Village. 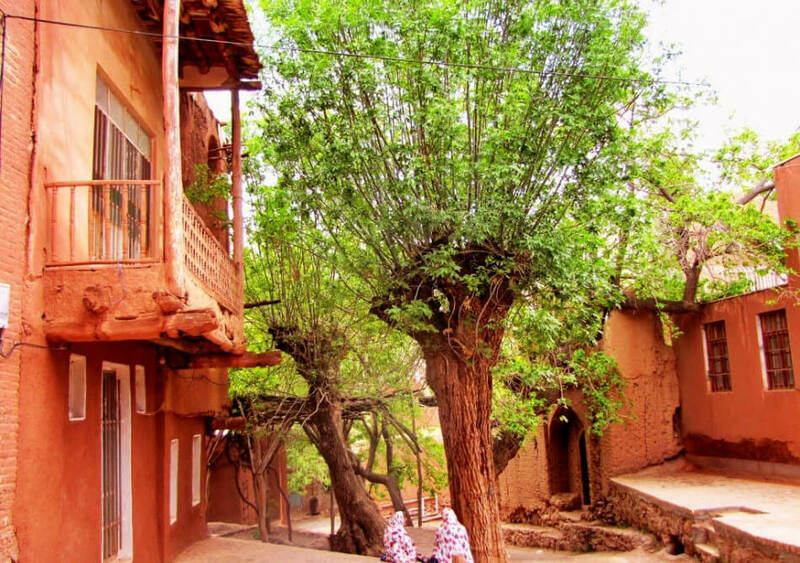 Abyaneh is located on the slopes of a mountain and that has created a step village structure. From some angles, it can be said that the village has four steps. These distinctive features are an attraction for tourists and locals alike. Houses from the Seljuk period: These houses have no courtyards. They have a porch with a height of 5 meters. There is an open space courtyard in the house, called Safeh, used for special occasions. The house has two floors, and the rooms are located around the Safeh. 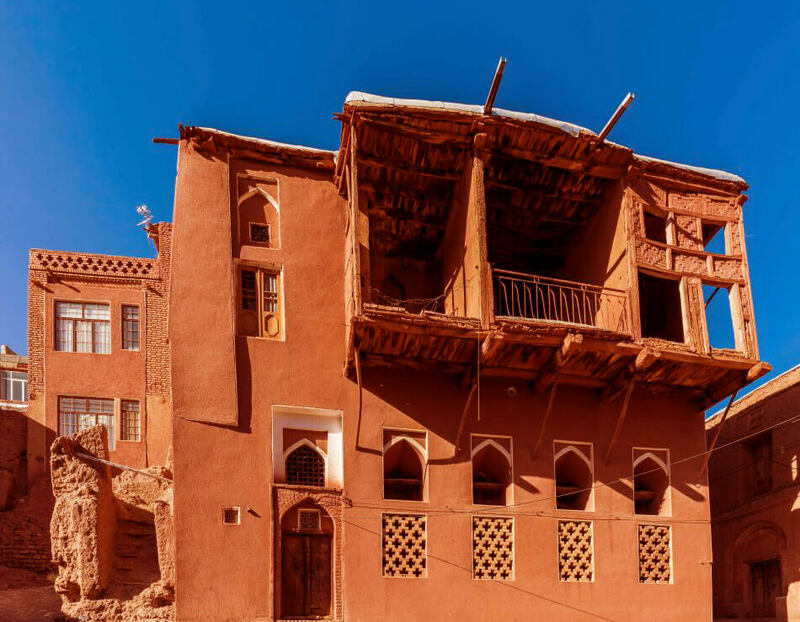 Houses from the Safavid period: During this period, the Safeh became more prominent and four- Safeh houses were in fashion. The architecture is well placed and the interior decorations are also quite distinct from the previous period. 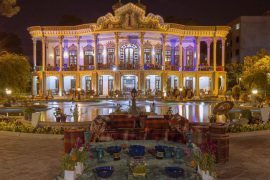 Houses from the Qajar period: Since the late Safavid period, there had been a recession in the general condition of the village that continued until the late Qajar period. Therefore, there was no particular change in this period. There were two door knobs. One for women on the left side of the door and one for men on the right side of it. The knob on the right was hammer-shaped and the one on the left had a circular shape. This was so that the homeowner knows the gender of the one knocking on the door. In Abyaneh of all the spectacles are not necessarily monuments; here culture takes on different forms. The people of the village have long been having retained their traditional clothing. Women wear Chador and men wear loose pants. It doesn’t matter if they are old or young or If they have been away for many years, they will wear the traditional clothes and strive to maintain their rich culture. An ancient and historical site located in Abyaneh. A Zoroastrian temple built in the mountains. The structure of the fire temple has four-arches, meaning that the ground is quadrangle and there is a dome covering it with the addition of four vaults. The temple is located on the main passage in the village. This fire temple is located within a Sabat; an indoor section of the passage that has been created to keep the sun out. Rubble trench foundation and plaster have been used in the construction of this building and still a small hall from the last floor remains to this day. 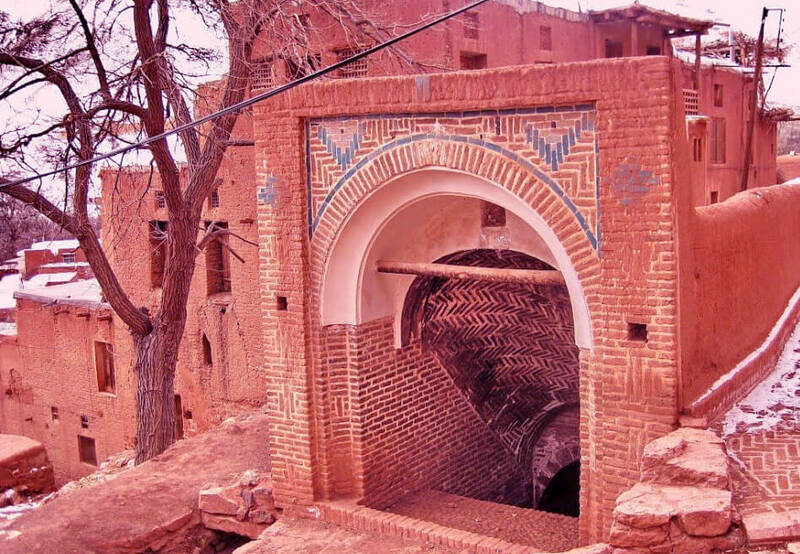 This building, like any other building in Abyaneh, is located on a high and low elevation ground, one of the interesting features of this fire temple. The building stretches along the alley, from the so-called high gate to the bottom of the alley, which makes it visible from all sides. The temple consists of an entrance hall that has three sections. The fire in the temple was lit and people respected that but that was a long time ago. The fire burned with coal, a fuel still found near the village of Abyaneh. 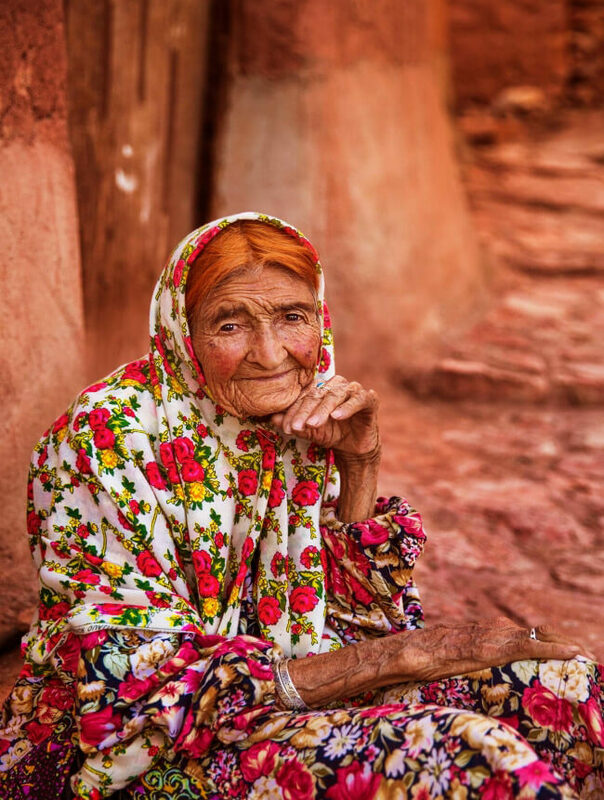 In the dialect of the people of Abyaneh, “Her” means “under”, and “pak” means “stairs”. Some attribute the name to Harpagus, which was one of the great figures in Achaemenid and Median history. The locals say Harpagus was a minister in service to Astyages, the last king of Media. Except for Herpak, there were two other fire temples in Abyaneh and both of them have been destroyed: Hershogah, located in the western part of Abyaneh and Dejaton which had been in rural parts near the village. Do Abi: The most important water source in the western parts of the village from which water can be used throughout the year. 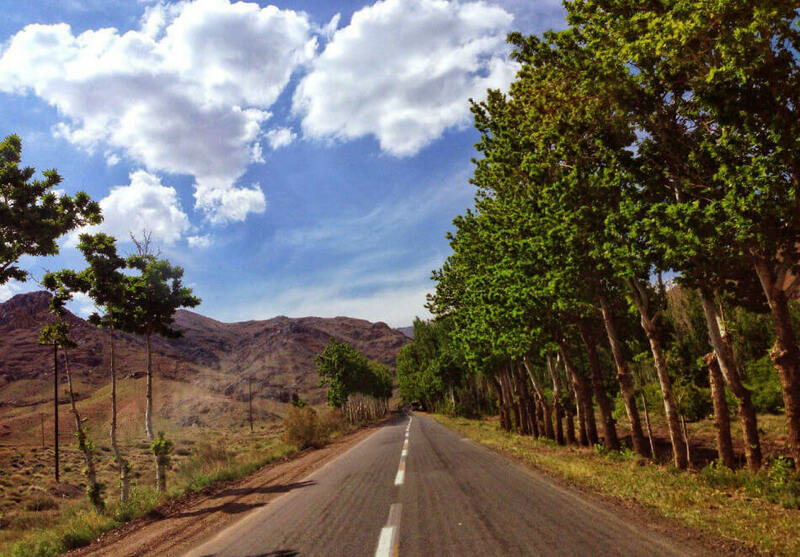 Raysun: Also located in the western parts of Abyaneh. The locals believe that this spring comes from a berberis plant and drinking it prolongs life. 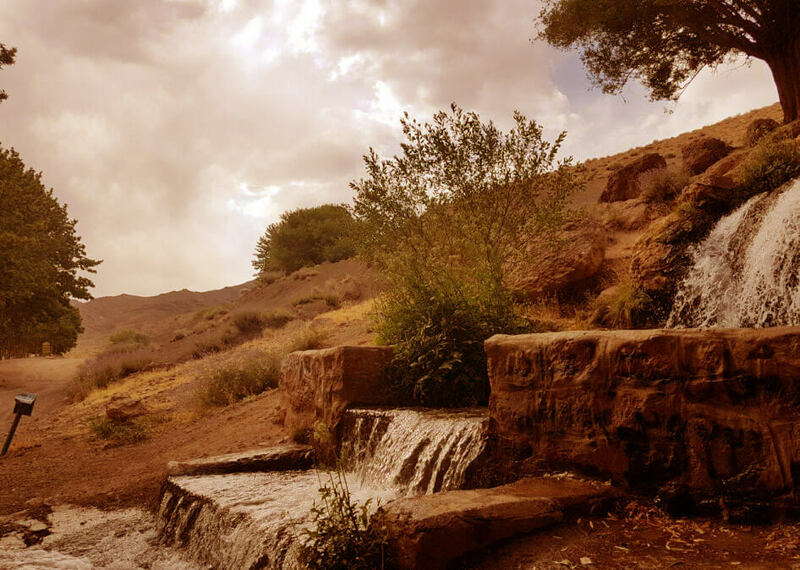 Tardar: A spring in the northern parts of Abyaneh, which is famous as the Tardar Qanat. 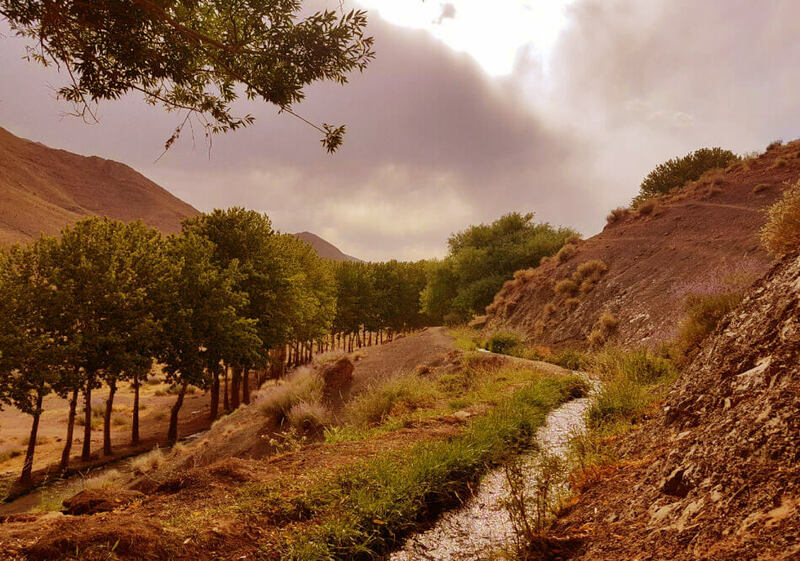 Springs located in southern parts of Abyaneh: Peyghestan, Veshasidera, Pasht-e Lil, Pa Ki JA, Pash Yuvinga and Pal Hamovun Bala. Springs located Six kilometers north of Abyaneh: Pal Hamun Her, Hyenza, and Karkashk. Going around the village and taking photos: the Village photogenic. Especially if you stand above the heights and see the prospects for yourself. Red houses on a mountain slope. Just imagine. When you go to the village, there is interesting stuff all around you; just remember that you must ask the locals permission before taking their pictures and do not insist on it if they are not willing. If you want to take pictures while wearing traditional clothes, you can easily rent one from the locals in the village. Despite being in the desert the nature around Abyaneh is quite beautiful, and, it has its own unique features. For example, you can go mountaineering. This way you can sightsee whilst climbing a mountain. 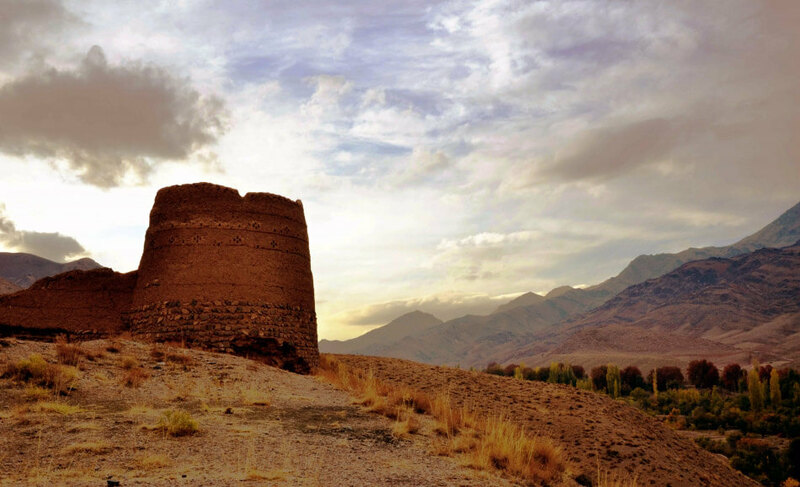 Palhone or Takht-e Haman: A castle located in the southwestern parts of Abyaneh, in the Yosemun neighborhood. The castle was built about 200 years ago. Hardeh: A castle located in the Hardeh neighborhood in the northeastern parts of the village. The thickness of the walls of the castle reaches a meter and it is about 4 to 5 meters high. All castles are made from clay, but in this one, they also used large rocks. Paleh: A castle located in the northwestern parts of the village in the Paleh neighborhood. The mill was used as an instrument for crushing wheat and other cereals, ultimately making flour. The long time ago there was a mill in every village and city. This machine worked with the speed of water or “water pressure” and played an important role in people’s lives. There are three mills located in Abyaneh. The locals living in the village call them “Are”. Namely, they are: Are Hare, Are Miun, and Are Dariun. They are on the river Dariun in the western parts of the village. Khanqah is a place where Dervishes and Sufis live. They hold education classes and gatherings and various other activities in these types of places. 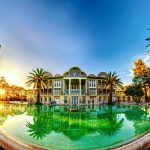 One of them is located in the neighborhood of Pas Khanqah or “After Khanqah”, and the time of its construction dates back to the era of Shah Abbas Safavid. it is a three-story building with a brick façade. 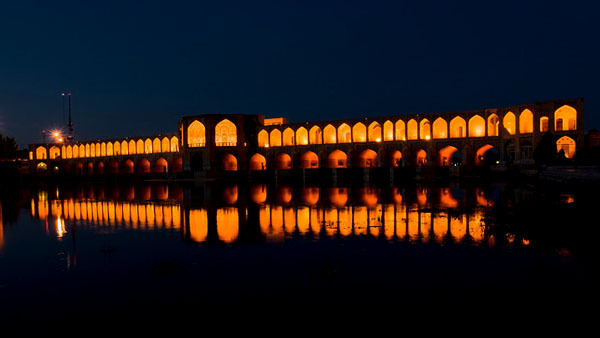 It has hinged vaults, and Safavid paintings have given it a special look. 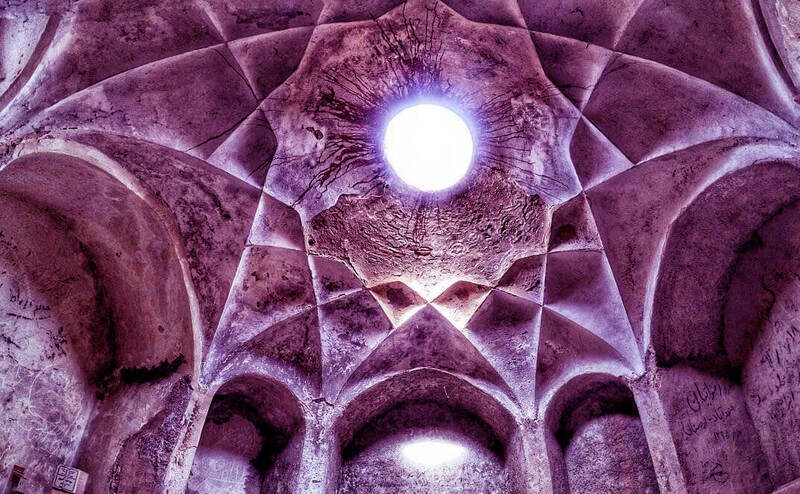 in the past it was a resting place for the Safavid king during summer, also the Sufis and Dervishes gathered there. 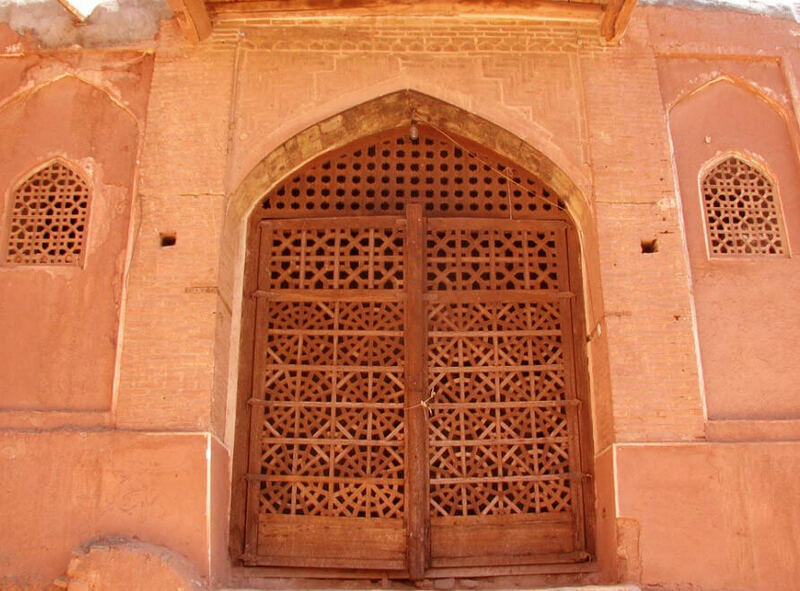 Ashraf Khanqah is also located in the village. 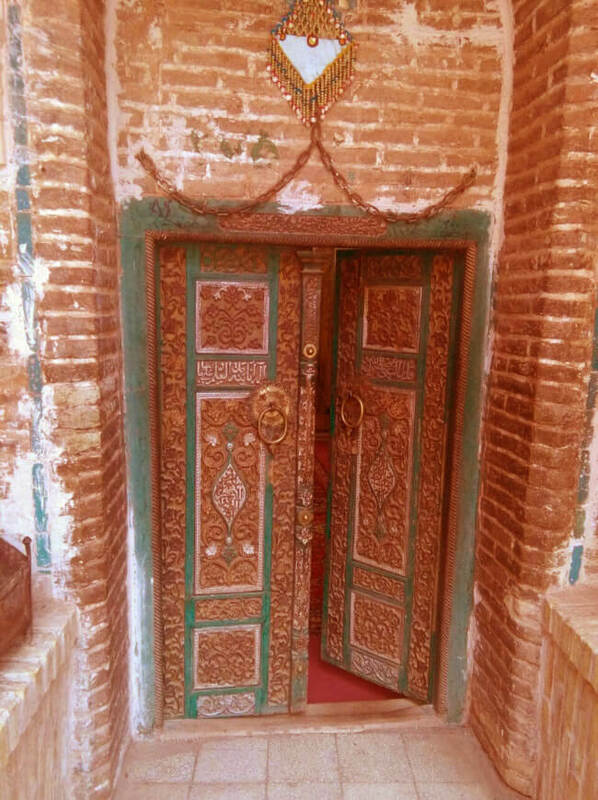 Its walls are decorated with lines that are said to be works of Reza Abbasi. There is no picture of this place. If you have a photo, send it to us and we will share it with your name. 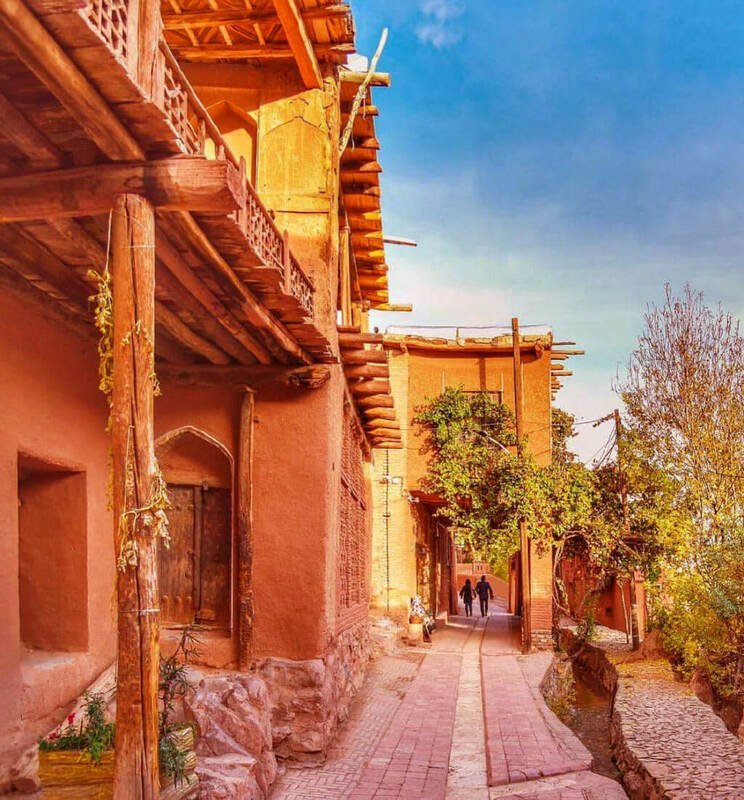 In villages throughout Iran, especially the ones located in a desert, the presence of a caravanserai is common and many examples can be found in different parts of Iran. Abyaneh has two caravanserais located in the western parts of the village. 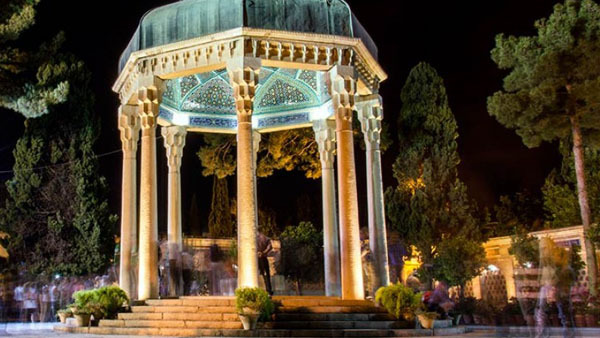 Fatemeh Zaghol was the woman who created one of these caravansaries and shortly after it became a place for bartering. Now the caravansaries are just ruins because a flood destroyed them. In addition to these two, there were some other small Caravansaries in Abyaneh, which were also destroyed. Besides the caravansaries, there were many camel houses in the area. These were places for renting out camels and also a resting place for travelers. They were big and spacious and each of them belonged to a wealthy person at the time. The owners rented out these places to the travelers. 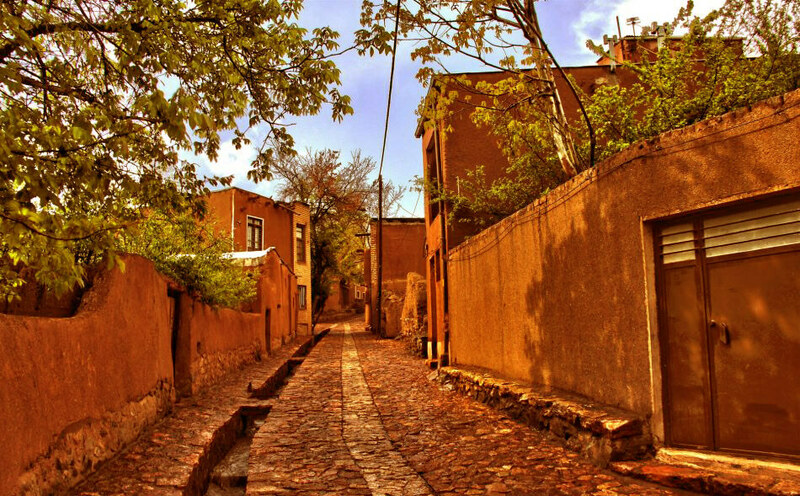 Mian Deh: It goes back to a hundred years ago and is located in Mian Deh neighborhood. Por Zaleh: Located in the northern parts of the village next to Por Zaleh mosque, one of the oldest water reservoirs in Abyaneh. Palizeh: Located in the Yosemun neighborhood. Pa Baghche or Pas Baghche: Also located in the Yosemun neighborhood. In the past, residents of the upper and lower parts of the village used separate bathrooms and barbers. Two public bathrooms are located in the village; the one located in the lower parts of the village is abandoned, but the other one is still usable. Bathroom maintenance and repair is provided through the locals themselves. In the past, the cost of bathing was one Toman for each person, but strangers were required to pay a bit more. The women paid with a slice of bread, and the boys would be exempted from bathing charges until they get married. Nowadays a box has been put out in the bathroom entrance room for donations. It is interesting to know that in the past they used astragalus plants in the baths. 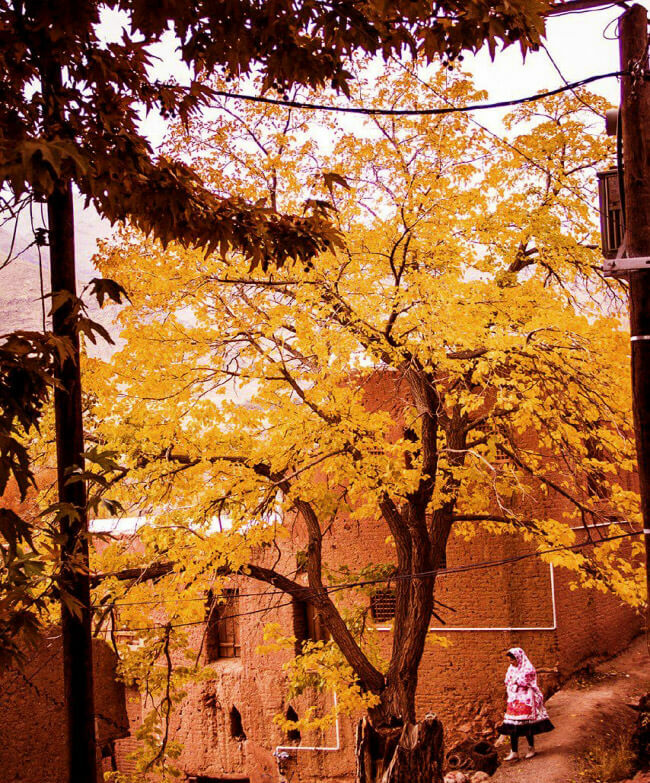 All year round you can visit Abyaneh, but do not overlook the beauty of early spring and the serenity of autumn. Spring: In early spring, the rain transforms the village. On the other hand, the concurrence of this season with Golabgiri (rose water festival) is not to be missed. Summer: Abyaneh is basically a village in the middle of the desert, but it has a milder climate compared to other desert villages. Autumn: The road to the village itself is mesmerizing, let alone the scenery in the village. 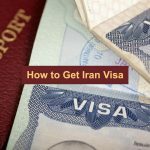 It is spectacular and it can be an exciting experience for you. Winter: the white snow along with the crescent houses, is an interesting conflict that is quite extraordinary.